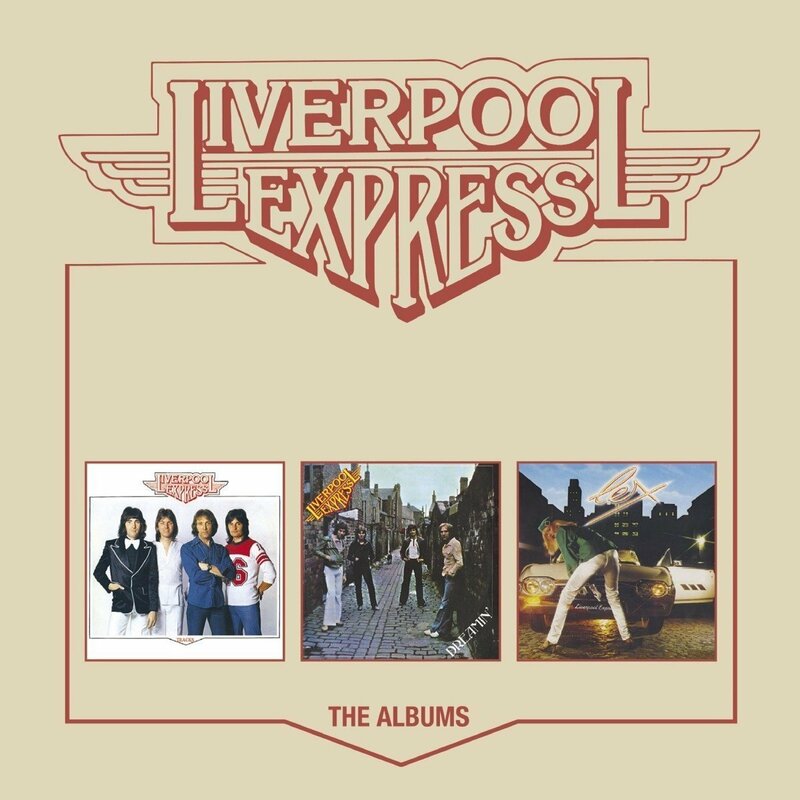 Discussions Magazine Music Blog: LIVERPOOL EXPRESS/The Albums (3CD box) reviewed! LIVERPOOL EXPRESS/The Albums (3CD box) reviewed! When The Beatles officially announced their split in 1970, it was definitely the end of an era. However, it wasn’t the end of the melodic three-minute Pop song. Not by a long shot. Badfinger picked up the Beatle-esque baton almost immediately. Then came The Raspberries. And Paul McCartney climbed back on his horse with Wings. And then there was Pilot. And we can't forget 10cc! Essentially, when The Beatles left the building, they left the door open and a slew of other Poptastic bands came in and tried to fill the void left by the Fabs. Time has been kind to some of these bands but many have been sadly forgotten. The band Liverpool Express falls somewhere in between. Hopefully, 7Ts/Cherry Red’s three CD box LIVERPOOL EXPRESS: THE ALBUMS – containing the band’s first three full-lengths plus bonus tracks – will remind the faithful just how good they were and introduce them to a whole new audience that missed them first time around. Formed by Billy Kinsley and other former members of ‘60s band The Merseybeats (and their offshoot The Merseys), Liverpool Express arrived in style back in 1976 with the album TRACKS. From top to bottom, this debut is chock full of Pop goodness. Their music bears a slight resemblance to Macca’s work with Wings mixed with the unbridled energy of Pilot. There are even hints of Badfinger’s Tommy Evans and The Dodgers’ John Wilson in the vocal department as well as Pilot’s David Paton and Sir Paul. One can even hear echoes of Alan Parsons Project within the grooves. Chock full of great backing vocals, handclaps and a cheery disposition. TRACKS is a wonderful Pop album. “You Are My Love” was the album’s biggest hit (they were big in South America, you know!) but there are plenty of other gems to choose from including “Smile (My Smiler’s Smile),” “Never The Same Without You,” “Doing It All Again,” “She’s A Lady” and “I’ll Never Fall In Love Again.” The slick production of the album may scream ‘MID-‘70s’ but the songs are timeless, lovely Pop nuggets. With three bonus cuts added, TRACKS is worth the price of the box alone. Their second album, DREAMIN’, was released in 1978 and while it doesn’t reach the heights of their debut, it is still a tasty platter of delectable audio delights. The songs are far more adventurous but just as melodic. At this point, it seemed as if the band were heading in many different directions, attempting new ways to present their delectable Pop confections. The album may be less focused, musically, but it is so damn fun! “So Here I Go Again” sounds like it may have been influenced by hearing Wings’ “Mrs. Vanderbilt” during a screening of Fiddler On The Roof while enjoying a cup of cappuccino. “Margie” is “Eleanor Rigby” if it fell off of REVOLVER and landed on THE WHITE ALBUM. “Songbird Sings Your Song” is The Beatles’ “It’s All Too Much” reinterpreted by Little River Band. “All Time Loser” and “Low Profile” are bluesy rockers. “Dreamin’” is the only track here that would have fit comfortably on TRACKS, although the emotional “Last Train Home” rivals almost anything on that debut. While my descriptions may make the album seem like it was a victim of the dreaded ‘sophomore slump,’ it is actually a bold move for the band. As great as the debut was, an album of half-hearted rehashes would have been a bigger disappointment. The glass is half full with this one! L.E.X., their third album, appeared in 1979. Produced by American songwriter and producer Tommy Boyce, the album finds the band refreshed and focused on blending their Pop chops with an updated sound. Most of the album is a return to the Pure Pop charm of TRACKS. “Is Your Love In Vain,” “I Want Nobody But You,” “Sharing You,” “What A Fool I’ve Been” and “Motel Maria” are melodic slices of aural heaven. Their second stab at “Last Train Home” (originally on DREAMIN’) seems a bit odd but it’s such a great tune that its reappearance here can’t possibly be considered a negative. “Don’t Knock Upon My Door” could be a Tommy Evans and Pete Ham rocker. While the album isn't perfect, it certainly succeeds in bringing the band back to their senses after the experimentation of the previous LP. All in all, L.E.X. is the band’s second finest platter and should be embraced by those that love the debut. Sadly, the band had already lost their commercial footing thanks to the influx of New Wave, Synthpop and Punk in the charts and the album wasn't a success. They were dropped from their label (Warner Brothers) and the band slowly disintegrated after releasing a few indie singles. Since this is a review and not a biography, I have left out the band’s connections to Status Quo, Mick Jagger’s girlfriend Jerry Hall, Derek Taylor and others. You’ll have to buy the box so you can read the liner notes yourself! And if you are a Pop fan and have read this far, you’ll definitely need to follow through and get this just to hear it for yourself. It really is quite wonderful.